Trouser Leg Length. . . Chest 35-37" 38-40" 41-43" 44-46"
Waist (adjustable) 30-32" 33-35" 36-38" 39-41"
Waist (rigid) 32" 34" 36" 38"
Inside leg (garment) 30" 30.5" 31" 31.5"
Sleeve & Shoulder (garment) 31.5" 32.5" 33" 34"
Neck Size 14.5-15" 15.5-16" 16.5-17" 17.5-18"
Hips 38" 40" 53" 44"
Inside leg (garment) 30" 30.25" 30.5" 31"
Sleeve & Shoulder (garment) 30" 30.5" 31" 31.5"
Chest 21" 22" 24" 26"
Waist 20" 21" 22" 22.5"
Inside leg (garment) 16" 18" 20" 22.5"
Chest (girls) 28" 31" 33" 34"
Chest (boys) 28" 31" 34" 36"
Waist 24" 26" 28" 29"
Inside leg (garment) 26" 28" 29" 30"
Sleeve & Shoulder (garment) 25.5" 28" 29" 30"
Sizes do not exactly correspond, therefore decimals have been used to show the relative sizes. 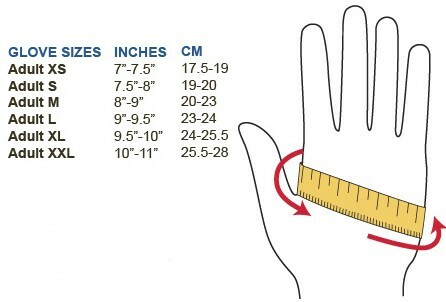 To determine your glove size, you will need a measuring tape. Place the beginning of the tape on your index-finger knuckle and bring the tape across the other knuckles. Continue moving the tape around the palm side of the hand until the tape touches the point where you got started. Gently make a fist. The point where the tape now meets is your glove size. Typically, women wear numerical sizes 6, 6 1/2, 7, 7 1/2, or 8 in leather styles. Fabric gloves with a high degree of stretch such as satin and velvet are a "one size fits all" size. Other fabric styles with a moderate amount of stretch such as cotton and silk styles range two sizes (A and B) with Size A fitting numerical hand sizes 6 and 6 1/2 and Size B fitting hand sizes 7, 7 1/2 and 8. A fine leather glove should fit snugly and should not bag on the hand. Fine, soft glove leather will stretch with the hand. This is where the phrase "Fits like a glove" originated! When removing a glove, never pull on the cuff. Fold back the wrist of the glove and work it gently over your fingers.